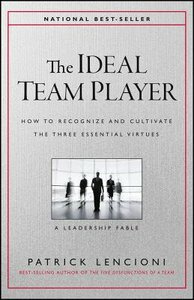 The Ideal Team Player is an essential teambuilding guide presented in fable form. Bestselling author Patrick Lencioni continues the story from The Five Dysfunctions as we follow Jeff Shanley to Napa, where he draws on the lessons learned from DecisionTech CEO Kathryn Petersen to take over the family business. Frustrated by a series of bad hires, Jeff turns to a local college basketball coach to learn the secrets of building a great team. You'll learn along with Jeff as the coach relates the three major traits that impact the team's success more than any technical approach and the teambuilding recipe that yields great results every time. A nonfiction model follows the story to show you how to implement these ideas in the real world, giving you a workable foundation for finding the right people for the job. Building a great team is a complex endeavor. It's not as simple as collecting the right skill sets--the human element is actually a more critical factor in long-term performance. This book shows you how to put the right people together to achieve your goals every time. The word "synergy" is often dismissed as a buzzword, but it's really an essential ingredient to a successful team. A collection of people with varying talents, skills, and perspectives can either clash and crash, or feed off one another's energy to produce incredible results. The Ideal Team Player shows you how to evaluate your prospects and pick the stars that shine brightest together. About "The Ideal Team Player"